The QX60 premium crossover is one of Infiniti's top offerings and now the company says that they will unveil a new 2014 Infiniti QX60 Hybrid at the New York International Auto Show. Big fuel economy increase detailed. When the New York auto show opens to the press on March 27, the all-new 2014 Infiniti QX60 Hybrid will debut and then be highlighted on the show floor during the NYIAS public days starting on March 29. The new QX60 Hybrid will utilize the Infiniti Direct Response Hybrid system. Although the numbers are pre-EPA certification, Infiniti expects the hybrid crossover to achieve a best-in-class 7-passenger luxury fuel economy of 26 miles per gallon combined. This will be done without compromising passenger or luggage space and the premium luxury crossover will retain all of its beautiful fit and finish. The hybrid premium will be only $3,000 on the MSRP of the QX60 Hybrid over the gasoline-only version. The hybrid will be available alongside its standard gasoline counterpart when it enters showrooms late this summer for 2014 sales. This will be the third hybrid in Infiniti's lineup of premium vehicles as they enter 2014 with the Q70 Hybrid and Q50 Hybrid, all using the Direct Response Hybrid system. 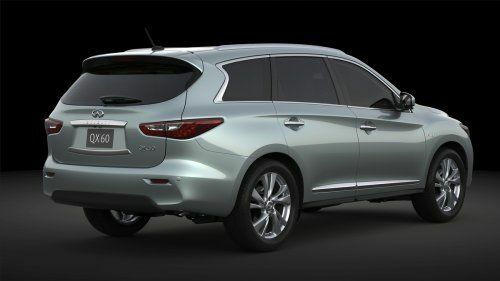 The 2014 Infiniti QX60 Hybrid will boast a 24 percent higher fuel economy than the non-hybrid, but will retain the same roominess, sporty handling, and styling. Badges will mark the Hybrid as separate from the gasoline-only, but it will otherwise appear the same. The QX60 (which takes over for the JX35) boasts a 2.5-liter supercharged engine hybridized with a 15kW electric motor on an advanced continuously variable transmission (CVT). Total horsepower will be about 250. The smaller engine with the added motor mean the fuel economy of a 4-cylinder with the power output of a V6. The small (size unspecified) lithium-ion battery pack is tucked under the third row of seating and is recharged through the engine and regenerative braking. A special electronic double clutch system allows the hybrid system to work in both front-wheel and all-wheel drive operation (FWD, AWD). Infiniti promises more information and details when the QX60 Hybrid unveils in New York later this month.